HAPPY NEW YEAR GUYS~!! Hope this year become another good year for all of us~!! Hmm, why I still can’t like him even kinda like his words? But why you sat in the floor in cold weather like that..? … Should I burn my 270 crystals for guaranteed Shingen/Mitsuhide new year’s card, or save for anniversary cards? Argh, why you make me confused like this SNB??? Happy New Years!! Bless our gacha rolls and some awesome story developments and for SNB to continue /o/!! I’m sure they have lots of braziers in the rooms during this season so it’s toasty warm :’D it’s not like there’s that much of a difference between a tatami mat and a futon… maybe LOL. Haha, those 270 crystals have to be paid crystals though! Oh god, if they come out with anniversary cards again that’s gonna be crazy but at least we still have half a year until then? I’ve done my rolls for the two New Year’s cards and got nothing so I’m sitting the rest out, haha. Maybe I should have rolled in the New Year instead but I’ll just imagine that I purged all my bad luck in 2018 with those rolls. That Nobunaga card! I need a fainting couch and a fan. Thank you so much for all your work. Happy New Year and may 2019 bring you many wonderful things! Nobunaga (and the rest of the warlords) are putting on some moves in this new year |D. You’re very welcome and thank you for taking the time to leave a comment! Happy New Year’s to you too! Aw, thank you and Happy New Year to you too! I’M JUST GONNA IMAGINE. UH. THAT SHE’S LYING ON HIS CAPE. OR ON HIM. 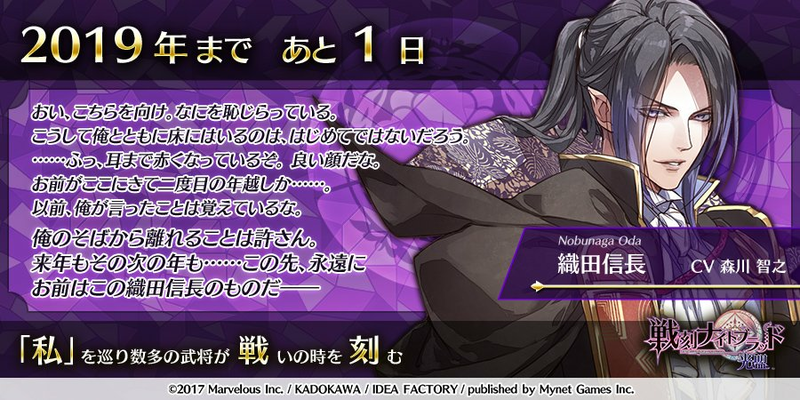 Nobunaga pls I’m sure you’re super rich or something so where the heck is the futon!? I think they all stepped up their messages this year :D feels more personable and in their character than the generic ones last year. Next up is their New Year’s resolution I think! Whatcha doin on the floor? A futon is more comfortable. Usuba nailing it with the artwork, especially Mitsuhide. Is there not a piece of work she drew where he isn’t gorgeous? Happy New Years!! May our gacha pulls be blessed and may everything else in your life go smoothly! !